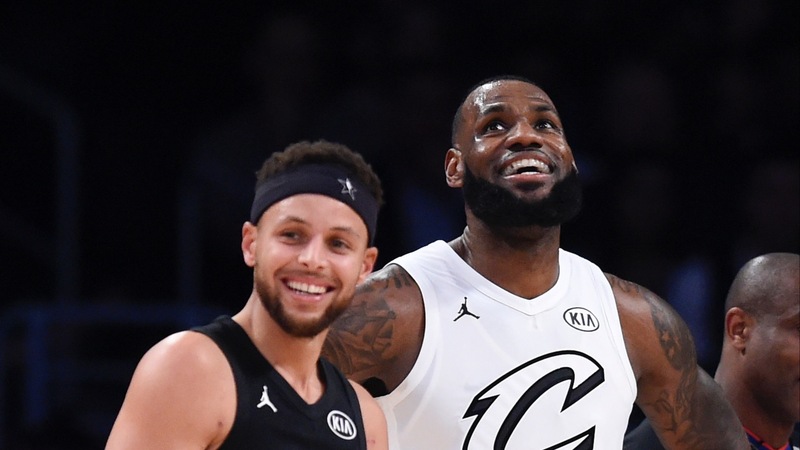 This is the second year players are picking the teams for the NBA All-Star Game -- Sunday in Charlotte -- and LeBron James' squad is favored to win for the second straight year. The Lakers star picked Kevin Durant with the first pick, while Bucks sensation Giannis Antetokounmpo took Steph Curry for the 68th All-Star Game. Last Thursday was a busy day in the NBA, with [the trade deadline](https://www.betchicago.com/nba-odds-to-win-title-after-trade-deadline-raptors-celtics-76ers-bucks) and the All-Star Game draft being televised for the first time. LeBron James of the Lakers and Giannis Antetokounmpo of the Bucks were captains for the ASG draft, because they were the leading vote getters in each conference. James was also a captain last year, when his team [beat Team Steph, 148-145](https://www.basketball-reference.com/allstar/NBA_2018.html), as 2.5-point favorites at his future home at the Staples Center. It was a #badbeat for Team Steph bettors, as Russell Westbrook hit a shot with 10.7 seconds left for Team LeBron for the final margin, and Team Steph didn't attempt another shot. Last week's draft featured the first All-Star draft trade, as The King traded Westbrook to The Greek Freak for 76ers point guard Ben Simmons. James joked that he wanted Westbrook and Joel Embiid -- noted enemies -- to be teammates. <a href="https://youtu.be/pJZOywAzPUs?t=77" class="embedly-card" data-card-width="100%" data-card-controls="0">Embedded content: https://youtu.be/pJZOywAzPUs?t=77</a> And LeBron even got Anthony Davis! Not on the Lakers, of course, but just for the ASG. __MORE:__ [NBA title odds following trade deadline](https://www.betchicago.com/nba-odds-to-win-title-after-trade-deadline-raptors-celtics-76ers-bucks) | [Bettors love the new-looj Sixers](https://www.betchicago.com/76ers-betting-championship-odds) ## NBA All-Star Game teams *Both teams are playing for charities in the Charlotte area. Numbers next to the names are the draft order (since LeBron got first choice of starters, Giannis got first pick of reserves). __Team LeBron starters__ (1) Kevin Durant, Warriors (the +200 favorite to be picked first, according to BetDSI) (3) Kyrie Irving, Celtics (5) Kawhi Leonard, Raptors (7) James Harden, Rockets Reserves: Anthony Davis, Pelicans; Klay Thompson, Warriors; Damian Lillard, Blazers; Russell Westbrook, Thunder (*traded to Team Giannis); LaMarcus Aldridge, Spurs; Karl-Anthony Towns, Timberwolves; Bradley Beal, Wizards; Dwyane Wade, Heat Coach: Mike Malone, Nuggets __Team Giannis starters__ (2) Steph Curry, Warriors (Curry dropped to -200 to be picked second after Antetokounmpo said publicly he'd take Steph with his first pick after Steph did the same with him last year) (4) Joel Embiid, 76ers (6) Paul George, Thunder (8) Kemba Walker, Hornets (+200 to be last starter taken) Reserves: (9) Khris Middleton, Bucks (+150 favorite to be first reserve off the board since he's Giannis' teammate); Nikola Jokic, Nuggets; Ben Simmons, 76ers (*traded to Team LeBron); Blake Griffin, Pistons; D'Angelo Russell, Nets; Nikola Vucevic, Magic; Kyle Lowry, Raptors; Dirk Nowitzki, Mavericks Coach: Mike Budenholzer, Bucks --Russell replaced the injured Victor Oladipo of the Pacers. Adam Silver [added Wade and Nowitzki to the rosters last week](http://www.nba.com/article/2019/02/01/dirk-nowitzki-dwyane-wade-added-all-star-game) as special additions after the voting process since both are set to retire at the end of the season. LeBron jokingly began to say he wanted Dirk on his team before cracking up laughing and taking his buddy, and former teammate with the Heat, Wade. ## NBA ASG spread So who's favored? Team LeBron is a 5.5-point favorite [as of Thursday afternoon](https://www.betonline.ag/sportsbook/basketball/nba) at BetOnline. __PLAY:__ Our free [Daily NBA Pick 5 game](https://betchicago.chalkline.com/games/nba-pick-5). Pick five select NBA games ATS to win a BetChicago prize pack.